Told here for the first time in riveting detail is Anna Marie’s gripping story, an almost unbelievable tale of multiple murders, deceit, and greed. Born in Bavaria in 1906, Anna Marie brought shame to her pious family when, as a teenager, she gave birth to an illegitimate son, Oscar. She was shipped off to America in 1929 where she initially lived with elderly relatives in Cincinnati. A year later she married Philip Hahn, a Western Union telegrapher, with whom she bought a new house and opened a delicatessen/bakery. Pressed economically by the Great Depression, the ever-resourceful Anna Marie found other ways to get the money to support her passionate pasttime—betting on horses. She tried burning down the house, then the deli, for the insurance; and she tried killing her husband, also for the insurance. Then she took to befriending the neighborhood elderly, latching on to their life savings before feeding them arsenic with deadly results. For weeks her Cincinnati trial for “the greatest mass murder in the history of the country” was a front-page sensation across the nation. A thousand or more curiosity seekers came daily to the courthouse to try to get just a glimpse of her. Nearly 100 witnesses gave damning testimony against her, and the jury’s guilty verdict put her on the path to the electric chair. Finally, after a year, all appeals were exhausted, and Anna Marie, age 32, was executed on December 7, 1938, at the state penitentiary in Columbus. 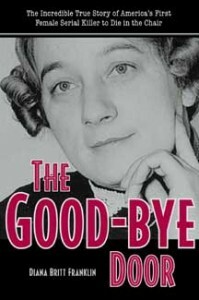 True crime buffs, historians, legal professionals, and others seeking an extraordinary story will find The Goodbye Door a compelling addition to true crime literature. Diana Britt Franklin has enjoyed a distinguished career as a journalist, public relations executive, and author. Born in England but raised in the United States, she began her career with the New York Herald Tribune and subsequently served in various editorial positions at the San Antonio (Texas) Light and the Columbus (Ohio) Dispatch. She also writes a syndicated food column for Universal Press Syndicate. In recent years she has authored or co-authored a dozen books under the name of Peter D. Franklin. The Good-bye Door is her first true crime book. Franklin resides in Ohio.